Last week, I had lunch with one of my investing heroes... David Dreman. A few moments after lunch, I introduced him to speak to a crowd of 400 or so investors. You have to realize, when the book came out, stocks had done nothing for a dozen years. David said that it was time to buy stocks – that they were incredibly cheap. I bet David and his mom were the only people to buy the book... NOBODY wanted to buy stocks back then. But he got it exactly right. The greatest two decades in the entire history of stocks was from 1979 to 1999. And Dreman, more than anyone else, called it. I love that Dreman didn't listen to what anyone else had to say. In 1979, he trusted his own research. He understood that stocks were dirt-cheap and out of favor. After a dozen years of poor performance in stocks, investors were busy buying gold and bonds and avoiding the stock market. Sound familiar to today? Smoldering inflationary fires will burst into an inferno once the unemployment rate falls below 7.5%, if not sooner. In this environment, good stocks, not Treasuries, are the place to be. What's he doing with money now? Given my bullish views, I am in buying mode... We will undoubtedly have more scares and volatility ahead, but if you've taken an ultraconservative ­approach to date, it's time to revamp your assets in preparation for rising ­inflation and interest rates. We think it's unquestionable that inflation is in our future for some time... it's just as certain that a portfolio of great companies will protect an investment portfolio from the challenges to come. You can read Dreman's white paper on inflation here. Dreman outlines his investment philosophy in his presentation here. And if that's not enough Dreman for you, this year, he put out a new version of his classic book Contrarian Investment Strategies. It's here. Dreman doesn't follow the crowd. He is the ultimate contrarian. And right now, this contrarian is expecting inflation, and he believes high-quality stocks (like cigarette giant Altria and banking giant Wells Fargo) are the best place to be positioned. The market can't promise you growing income. It can't even promise you steady income. Only the World Dominating Dividend Growers can. The Second Amendment is alive and well. It doesn't matter if you're Republican, Democrat, Libertarian, or a member of the Peace & Freedom party. There's one thing we can all agree on... The Obama administration has been bullish for gun sales. Gun manufacturer stocks like Smith & Wesson (SWHC) and Sturm Ruger & Co. (RGR) bottomed almost exactly four years ago and have been soaring higher ever since. 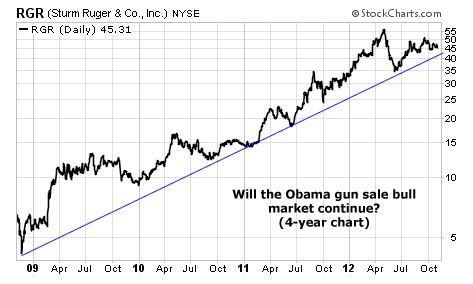 So the question traders should be asking themselves ahead of next week's election is... "Will the Obama bull market in gun sales continue, or is it time for a Romney correction?" "There will have to be a global reset for money…"
"The 'people' are merely election-day pawns…"